During my 2nd week into summer “vacation” I met with nine other secondary science teachers from my district. We set forth on a week-long curriculum design journey that involved the new Michigan Science Standards (basically NGSS). We discussed a variety of items including exploring available resources, professional development opportunities, schools throughout Michigan and the US that have already incorporated NGSS into their science curriculum, Google Classroom, and writing content specific curriculum. In this article, I would like to share some of our findings and introduce a proposed unit plan for our nuclear chemistry unit that has been redesigned from the ground up. I will begin with professional development opportunities. During our discussions early in the week we agreed that we still don’t know much about NGSS. Many of us have been to previous trainings, workshops, or seminars (NSTA for example) but still would say that we lack a sense of clarity with how to best integrate NGSS. We want MORE professional development (PD) opportunities to help us better grasp and understand what we need to do. We found a few NGSS trainings (NGSX) throughout Michigan but registration was either closed already or the times conflict with our district meetings at the start of the next academic year. Plus they are expensive. We were able to contact our local RESA and inquire about local trainings similar to the ones we found. By the sounds of it, some are being planned for our county that some of us might get to participate in. There is also an NGSS workshop in Detroit in August through NSTA that a number of teachers from our curriculum team will be attending. As we discussed PD and things we need help with, a big sticking point for us is the lack of an assessment. What kind of standardized assessment will be used in Michigan? What happens when teachers have redesigned or modified their curriculum only to find out that the assessment is not matching up well? Shouldn’t there already be an assessment in place? Surely we will have to rewrite our common final exam for Chemistry 1/Honors Chemistry 1 and Physics 1/Honors Physics 1 to integrate NGSS assessment requirements but what will this look like? 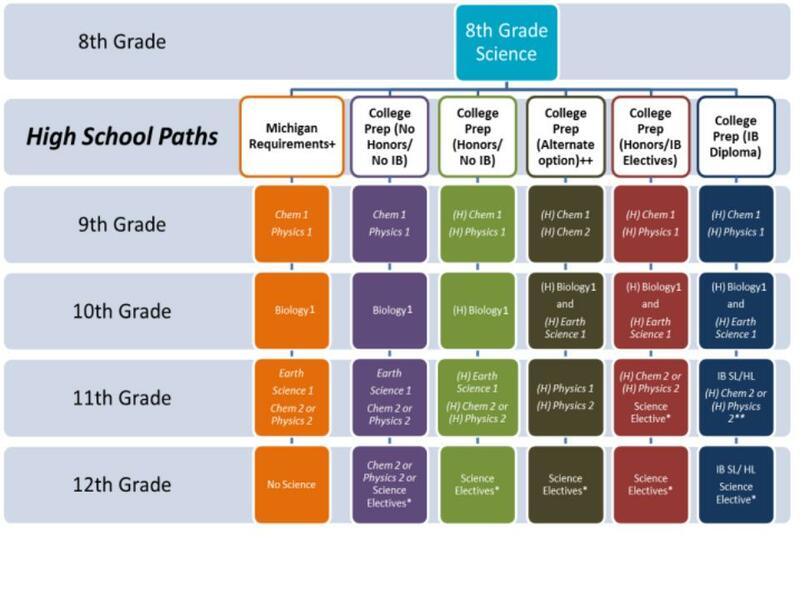 The next issue I’d like to share is current integration of NGSS and course mapping in other Michigan schools, particularly IB schools since that best fits with our district model. We did not find much that was helpful. In fact, we felt that we may be at the forefront of this in our region and/or state but are not sure. There does not seem to be very much information published on the web from school districts regarding the integration, and course mapping seems to be unchanged. If you are from a school in Michigan or an IB school in the US, would you please comment with how your district or department is integrating NGSS into your science curriculum? We would greatly appreciate the communication and collaboration. Furthermore, if your district or school is adjusting the model for course mapping we would appreciate hearing about that too. We did discuss the three different models from Appendix K of NGSS and compared them with how we currently map our courses (see Figure 1). Our method fits well with IB preparation. We are unsure if it would be beneficial to adopt one of the three models in place of our current model; we did determine which NGSS standards exist currently in each science course. More discussion is needed and a K-12 Science Curriculum committee was created at the district/community level but is awaiting parent involvement. Figure 1. Current model of science course mapping in Portage Public Schools. Lastly, I would like to share a proposed unit plan for Nuclear Chemistry and our rationale behind it. This stems from myself and another chemistry teacher from our curriculum group but has not yet been shared with additional chemistry teachers at the district level. Before I do I would like to share one thought: in the process of researching NGSS compliant lessons we found that a number of educators modified their existing curriculum or lessons to match up with the Science & Engineering Practices even though the lessons’ content did not necessarily meet the DCIs (disciplinary core ideas). With this in mind, we set out to redesign our unit plan from the ground up instead of modifying bits and pieces just to say it was NGSS compliant. Order of content instruction ~10 day sequence including “lab” and summative assessment. Nuclear Radiation Web quest re: types of radioactive decay, then create model for 1 of 3 types and create 30 sec video demonstrating the model and share with class (groups of 2-3). Students would use Chromebooks in classroom and/or phones. Disciplinary Core Idea: PS1-8 → Develop models to illustrate the changes in the composition of the nucleus of the atom and the energy released during the processes of fission, fusion, and radioactive decay. I would appreciate your feedback and suggestions as we move forward with NGSS integration.